Possibly the most exciting new launch in Yishun for decades, sales took off in astonishing fashion when we saw North Park Residences sold over 300 units out of the 430 released in a day, during a soft launch on 5th April 2015. As mentioned by Nicholas Mak, executive director of SLP International, the main reason for the healthy sales at North Park Residences was mainly due its close proximity to Yishun MRT Station. And aside from transportation, residents will also enjoy the convenience of access to an established shopping center. These attributes are very attractive to property buyers and this gave the developments Fraser Centrepoint (FCL) the absolute go-ahead signal to construct the 920-unit North Park Residences there. Such developments are rather uncommon for property developers especially in today’s very competitive real estate market in Singapore. One of the other stunning developments in launched in recent years, J Gateway, is situated within minutes to Jurong MRT station, almost sold out their 738 units during its launch last June 2013. This was another sign that proximity to transportation and shopping malls making a significant effect in buying sentiments. Mr Mak also said that when you are battling with today’s world, you need to get up there and maintain your spot by keeping the momentum alive. He also implied that it is rare nowadays for developers to launch a project with so many positive attributes because North Park Residences is just located opposite Yishun MRT Station and none of the condominiums around the precinct are less than 10 minutes away from the MRT, such as Skies Miltonia (located at Miltonia Close). Thus, it is a good upgrade from the HDB flat dwellers that are seen there. During the soft launch, units were only opened to buyers who registered their interest during the 3-week preview before 5th April 2015. Most units were sold to Singaporeans, which accounted for 88% of the total sales for Phase 1, at an average price of S$1,300 per square foot (psf). In terms of absolute quantum, the units were transacted from S$612,000 for just a studio apartment, to a 5-bedroom unit at S$1.89 million. 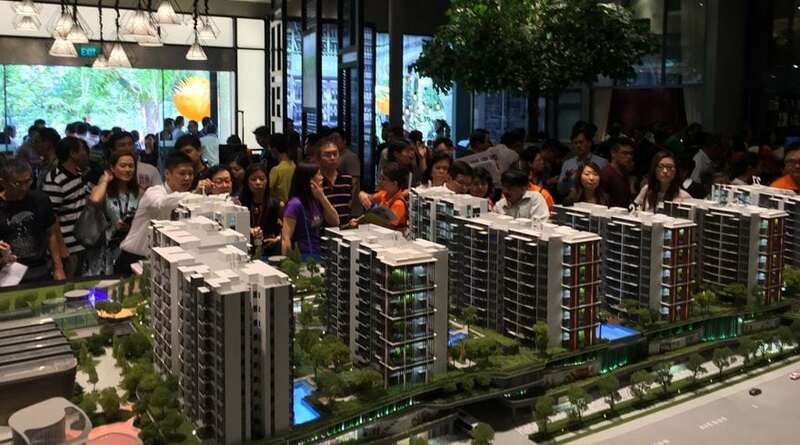 More than 5000 visitors seen at North Park Residences showflat in 3 weekends. North Park Residences is sitting right above Fraser Centrepoint’s upcoming integrated development Northpoint City. It is made up of a total of 12 residential blocks, each at 10-storey tall. This will be FCL’s 4th integrated project in Singapore. Cheang Kok Kheong who is the CEO of Fraser Centrepoint said that they have received more than 5,000 visitors in the course of the 3 weekends of preview. They were prospective buyers and investors who are interested to buy a unit in an integrated development such as the North Park Residences, and the sales responses and figures have reaffirmed their aspirations for this project.